EDMONTON, AB Sep 1, 2015/ Troy Media/ – Merchandise is as much a part of the concert tour experience as the music for many fans. It’s also a much needed revenue generator for many performers. 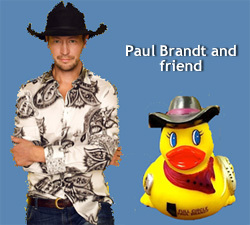 While my mind turned immediately to my youth and Ernie’s Rubber Duckie from Sesame Street, it turns out Brandt was referring to C.W. McCall’s novelty trucking classic Convoy,from way back in the mid 70’s. I should have guessed immediately, having owned that classic 45-RPM record that encouraged me to get my first CB Radio. Read full article at Troy Media. Scosche Industries, the folks that brought you the boomBOTTLE, the rugged wireless water bottle-shaped speaker that we looked at here at CanoeTech Blog back in 2013, has upped the ante with the release of their new and enhanced boomBOTTLE+(plus). It’s still designed to be a good match for your bike’s water-bottle holder (or car’s cup holder), but it’s more rugged, more powerful and better sounding than the original. The housing is made from TPU (thermoplastic polyurethane) that’s durable and shock absorbing. And while it’s no black box, it’s certainly designed to withstand shocks and drops. It’s also IP67 rated so it’s both dustproof, yes, even the speaker grilles and water-resistant to three feet. In fact, it should actually float in the event it gets dropped into the water. Read more…at Canoe Tech Blog.